The uniqueness of DXN Vita Cafe! An exclusive 6-in-1 coffee added with Ginseng, Tongkat Ali and Ganoderma extract. A refreshing drink with exquisite traditional flavour and delightful distinctive aroma. It is easy to prepare; enjoy it at home, work, anywhere and anytime you want a cup of hot gourmet coffee. It is exciting and versatile - you can enjoy it hot, ice-cold, ice-blended or chilled! Only selected high quality ingredients are used. It is free from additives and preservatives. A complete health drink that is suitable for daily consumption. 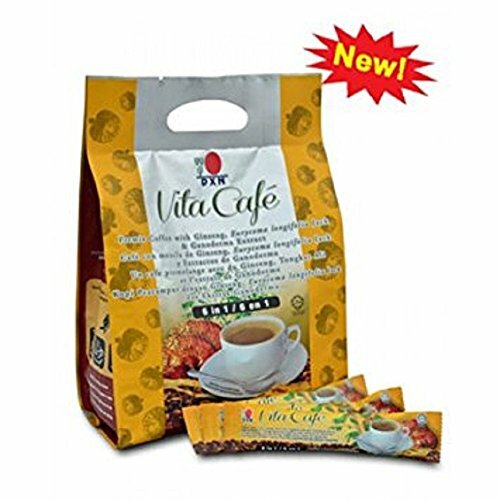 DXN Vita Cafe is conveniently prepared in the form of premix coffee for easy consumption. All you need to do is add the instant powder of Vita Cafe into a cup of hot water to experience the rich aroma of Vita Cafe. Vita Cafe is the latest, great tasting coffee, brought to you by DXN! It is a unique blend of high quality Ginseng and Tongkat Ali powder with Ganoderma extract. Ingredient : Instant Coffee Powder, Sugar, Creamer, Ginseng Powder, Eurycoma Longiflia Jack Powder and Ganoderma Extract. By Healthy drinks, tea, water, etc.